Ask fellow campers about "Rio Chama RV Park" and nearby attractions. Question: How often does the train come through? Does it wake you up? Answer: Train came by twice a day (around 9:30 am and 4 pm) while we were there in first half of June. Would it wake you up? Would it wake you up? No. We had a spot over looking the river and train tracks used for the old steam engine. Utilities are placed in the proper area and worked fine. Overall I liked the park. We camped here in a 40' motorhome. We camped at Rio Chama RV Park in a Motorhome. We spent a dozen days at Rio Chama in the fall when towering trees cloaked the campground beneath a canopy of golden leaves. Like most RV campgrounds, sites are close together, but even when we had neighbors adjacent to us, we didn't feel closed in. Restrooms are a bit small with only two showers for each gender, but we never had to wait. 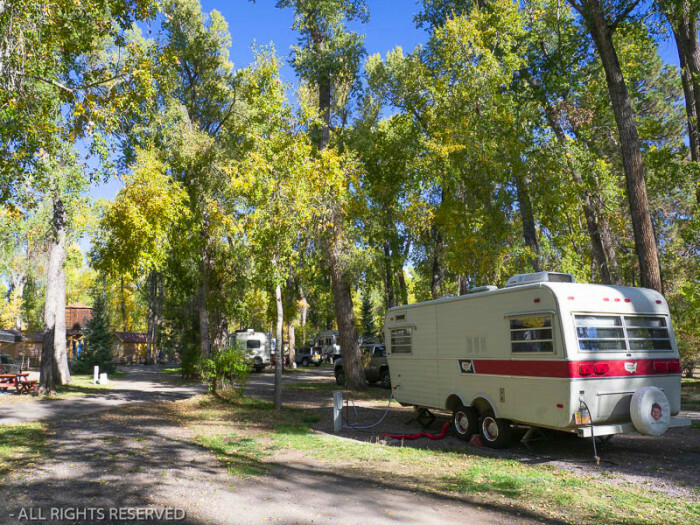 The campground lies adjacent to the Cumbres & Toltec Scenic Railroad. Coal-fired steam locomotives pass by on the narrow-gauge tracks at 10:00 a.m. and 4:15 p.m. every day. Park guests gather trackside to wave to the train at each passing. 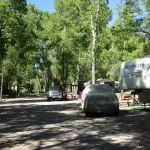 We camped at Rio Chama RV Park in a Travel Trailer. It's a ten-minute stroll to the train depot, allowing guests to leave their cars in the campground when riding the train. The park is embedded in a dense grove of narrow-leaf cottonwood, which made it very shady. We liked that and the general ambiance and didn't care if sat tv didn't work. Wifi was usually very slow but Verizon 4G Lte was excellent. There are a great variety of sites and a lot of empty ones, so a lot to pick from. Big rigs might have problems with tight turns and narrow streets. 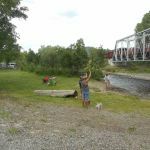 It was fun to meet other campers and their dogs at the train bridge over the river when the train came by. The river is not visible from the park because of a bank and a fence. There are gates for river access. We will return. We camped at Rio Chama RV Park in a Motorhome. Stayed for a week. Local train ride was a good experience. Nice restaurants in nearby Chama. Spaces big, lots of trees. Good service. We stayed a week and would stay here again. We camped at Rio Chama RV Park in a Motorhome. Chama River borders park. Cumbres-Toltec Railroad goes right next to park; some noise from this. The RR offers a scenic ride to Colorado-about 2 hours each way. Downtown Chama quaint. We went to Los Alamos one day. Did the "Magic Circle" drive another day. Nice pull through, friendly staff, turns a bit tight but manageable, very close to downtown and the Train. Big +++++ for the Dog Park, our pups loved it!! Would certainly return. We camped at Rio Chama RV Park in a Fifth Wheel. This RV Park is literally a park. The sites are distributed among trees and a river flows through it. In season the Cumbres and Toltec Scenic Railroad runs through the park and the depot is accessible by foot. There is an amazing fenced dog yard. We camped at Rio Chama RV Park in a Motorhome. 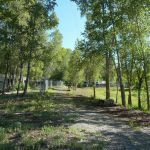 Located by the Chama river and the C&TS railroad bridge over the river amid cottonwoods. It is a basic, no frills park in a beautiful setting with friendly, helpful staff. This is not an "RV resort" experience kind of rv park, but I gave it a 10 because it has all I need and is an excellent value and the ambience can not be beat. I had a level, 30 amp site and didn't use showers/restrooms. First time back for me in many years and it is still the wonderful place I remember. Chama is all about scenery, outdoors and coal fired narrow gauge steam railroading and this is the best park, by far, to experience that. We camped at Rio Chama RV Park in a Motorhome. Go down to the rail yards in the evening after the train has returned. Walk around among the steaming locomotives and rolling stock and equipment and experience the sights, smells, sounds and feel of a bygone era and ride the train. We camped here with our two small dogs for 3 nights and had a great time. The camp sites were level and spaced normal compared to other campsites, but the entire RV park had shade trees throughout and our specific site had shade for the entire day. The park was quiet and the river was great even though I did not catch fish. The management was great, helpful and friendly. Maybe one of the top 2 to 3 RV parks we have ever stayed in and we will definitely be back. Just a beautiful place to camp. We camped at Rio Chama RV Park in a Fifth Wheel. We love this RV park and have already booked a 2 month stay for 2018. The people are friendly, there are some excellent sites, some others are close together, but all-in-all we just love it. We volunteer to work on the Cumbres & Toltec Railroad throughout the summer and the Rio Chama RV Park is right next to the rail yard. There are lots of railroad volunteers that stay here and lots of other people from Texas, Oklahoma, Arizona, and other places that are hot in the summer. We were fine on our 30 Amp site as we seldom had to run the AC. We did trip the circuit breaker a couple of times but figured out how to manage it. Do to our rig size, we will not be able to camp in site 40 any longer which is a real disappointment as it is truly one of the best sites in the park. The 50 Amp sites are nice, but much closer together, and about half without any shade trees. But again, it is not very hot in Chama so it shouldn't be a big deal. Lots of the best spots are reserved by long time customers. People have camped in some of these same spots for over 12 years. They have a new dog park if you are a dog owner. For us this was a draw back as it was fairly close to our site and we were frequently exposed to excessive barking as people went to and from the park. We always enjoy watching the train come and go across the trestle directly behind the RV park. It's the big attraction and it's fun to wave at the passengers. It's even more fun to be a volunteer on the railroad. We camped at Rio Chama RV Park in a Fifth Wheel. You must ride the train. It is just the most beautiful scenery you can imagine. The lunch they serve at the half way station is excellent. It's just a blast and we do it frequently. Price is from memory as we had a minor credit card "moment" checking in, quickly sorted. Site has very easy access to the Cumbres & Toltec railroad depot; the reason we and I suspect many others will visit the area. The line runs right along the site. We had a pull through site, one of 2 or three from a single access point, so initial access was a little tight in a 32 ft motorhome, but OK once we were parked. Very large site as well with large lawn, easy to connect up and mostly level on a mix of dirt and gravel. We found it easy enough to walk to the railroad depot, but you are very high in the mountains, so some may find it a struggle. We stayed 3 nights. Everyone was super friendly, all stopping to have a chat. Many trees, so plenty of dappled shade. WiFi was good and available when we needed to use it with decent download speed, even inside the RV. We camped at Rio Chama RV Park in a Motorhome. The Cumbres & Toltec railroad is an absolute must. A great day out. Nice park. Lots of trees. Several repeat campers. Sites are too close together. Many barking dogs! Electricity good. No cable tv. Fair wi-go. Gravel roads and sites. Mostly mature adults. We camped at Rio Chama RV Park in a Fifth Wheel. My wife and I stay here every summer for a month while doing volunteer work with the RR restoration group, so part of the attraction for us is being with our friends from around the country. We love it here and wouldn't stay anywhere else in town. Objectively, the spaces could be considered a bit tight, and there were occasional undervoltage problems in some spaces that the owners were trying to fix with the local electric company. Otherwise there's everything to like about it. Can't comment on the wifi as we use our own Verizon hotspot. The showers are dated, but adequate with plenty of hot water on chilly mornings. Staff is super in all respects and have helped us in too many ways to list. We'll keep coming back year after year. Our rate reflects the monthly rate for railroad restoration volunteers. We camped at Rio Chama RV Park in a Travel Trailer. When in camp strike up a conversation with some of the RR volunteers with the group called "The Friends of the Cumbres and Toltec Scenic RR" to get tons of facts and tips about the RR. Walk around the yard and examine the old equipment, much of which dates to the 1880s. For night life try Fosters Saloon or The Brew House. Plenty of restaurants during the train season. Chama is a good base location for day trips around the area. A lovely park. We spent three days and I would have stayed longer except we didn't have time. I will return and stay a full week next time. Wifi was great and our site backed up to the river and the train bridge. The site itself was shaded, large, and the other campers were so friendly. Walking around the campground was neat as they had old train cars all along the edge. The bathrooms and showers were a little hokey, but clean and I had no issues with them. We camped at Rio Chama RV Park in a Travel Trailer. Watch the train leave and arrive each day at the river. Its a campground tradition it seems. Also, make sure you ride the train. It was a blast for my whole family. We rode roundtrip to Antonito with the train portion from Antonito to Chama. It starts from the flatlands of Colorado and the scenery just gets better. The lunch halfway was yummy too. We came for three days and signed up for 5 more. Beautiful huge cottonwoods LOTS of shade and right on a creek with trout. Not much TV and nightlife but a great place to just unwind. We will come back to this park for sure. We camped at Rio Chama RV Park in a Motorhome. A super-nice park...perhaps our favorite rv park ever :-) Staff are extremely friendly and helpful. The park is alongside the Chama River and adjacent to the train depot (as others have noted). Can see the train come and go easily and is quite a sight! Everything was clean and the sites are under a huge canopy of cottonwood trees; cool and shady. We absolutely plan to return! We camped at Rio Chama RV Park in a Motorhome. You have to ride the Cumbres & Toltec Scenic Rail Road. Fantastic experience. There is a grocery store and Ace hardware in Chama which was very convenient. There are also several restaurants in the area. High Country Saloon was best, followed by the Box Car Café, and then the Elk Horn Restaurant. Quaint downtown a must see. The train is lots of fun too! 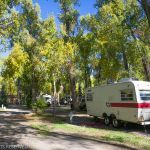 Are you affiliated with Rio Chama RV Park ?